Over the years, I’ve written extensively on the topic of social media marketing. I’ve covered the spectrum of topics from social media research and management to monitoring and measurement. As Facebook, Twitter and other social platforms take heat for ill-fated privacy policies and stances on advertising, I thought it would be prudent to revisit fundamental social media strategies that matter as much today as ever before. Consider these ten social strategies as you revisit your social media channels and marketing initiatives for 2019 and beyond. •	Videos are 5x more engaging than the written word. •	90 percent of consumers believe that videos are helpful in the decision-making process. •	According to Aberdeen Group, video marketers get 66 percent more qualified leads per year and achieve a 54 percent increase in brand awareness. More importantly, search engines and social media platforms love interactive multimedia like video and weigh it accordingly. Websites and pages with embedded video tend to rank better than those that don’t. Video also generates better reach and engagement than text or images. Since most marketers are strapped for cash and resources, video also has the benefit of being the highest life form online. A single 2-minute HD video creates not just 2 minutes of video, but 2 minutes of audio, thousands of high-resolution images and can be transcribed into text for blog posts or articles. Related article: Creating and Optimizing Videos for the YouTube Sales Funnel. One question I used to get in the early days of social, and is still quietly whispered today in planning meetings, is “what type of content should we put out on social media?” Interestingly, this question has come from global brands, not just smaller startups or SMBs. While most brands have figured out a content strategy and calendar, many brands have failed to fully-leverage budgets, creative assets and people to create maximum reach and engagement. Regardless of your level of sophistication, a well-informed content strategy is in order. When building out a content strategy, I recommend starting with foundational research. Benchmark your competitors and industry players, including publications. Identify trends and gaps in the content. For additional insights, review content comments, ratings and reviews. This is particularly true with videos and podcasts. Reach metrics like subscribers or engagement metrics like shares are also helpful. Consumers are happy to tell you (and your competitors) what type of content theme, format and frequency is ideal. Listen. I also recommend asking employees, partners, customers and prospects what they would like to see from you. Most likely, the content will need to be useful, inspired and empathetic. As the adage goes, “facts tell, stories sell.” Far too often, brands, particularly business-to-business companies, lean on facts and figures, which ignore the truth that all purchases are emotional at some level. People want to connect and crave meaning, so tell your story via social media and foster that connection. The Internet is your canvas, so become a painter. To scale, look beyond your junior-level social media manager and tap employees, customers and partners for unique, authentic and compelling content. Consumers prefer to hear about your brand from real customers, so foster that connection. While videos (interviews, how-to’s, etc.) are always safe, don’t underestimate the power of audio, imagery and text (mix it up!). Explore animation, celebrity endorsements or even micro-influencers. Be thoughtful in your approach to the latter, as there are legal and ethical obligations. As I’ve alluded above, stories sell, especially third-party endorsements. Harvest happy customers by encouraging them to post reviews on popular third-party sites like Google My Business and Yelp. Do the same with happy employees on sites like Glassdoor and Indeed. According to research, brands can increase customer advocacy by up to 25 percent by replying to a review or decrease advocacy by up to 50 percent by not replying. Don’t be on the wrong side of that statistic by regularly monitoring and engaging with those that post reviews, questions and complaints. Most importantly, build reviews and ratings into your process and culture. If a waiter receives a 20 percent tip, they should recognize the opportunity to request a review from that patron. Related article: How to Respond to Online Reviews: Best Practices. Consistency is essential, when it comes to creating a meaningful and effective social media presence. The ideal post frequency maximizes the opportunity to stay top-of-mind with constituents, without annoying them. We recommend a daily minimum posting cadence with popular platforms like Facebook, Instagram, LinkedIn and Pinterest. Some platforms, especially Twitter, beg for a higher volume of daily posts while others like YouTube are difficult to maintain at even a 2x monthly cadence. The best way to develop a proper post cadence is to monitor reach and engagement metrics across each platform on a daily and weekly basis. Increase or decrease frequency, tweak topics and optimization strategies until a new baseline is created, then refine further. An editorial calendar helps plan and visualize the editorial strategy for the forthcoming months. By using data to plan topics and content formats, brands can efficiently scale and plan content creation efforts. Use a shared calendar, Excel spreadsheet, Hootsuite or a Sprout Social scheduling calendar to map out ongoing content development efforts across the organization with details, including: Content title, Subject, Topic, Content type, Image/s, Deadline and Owner. Related article: How to Become a Social Media Guru in 3 Easy Steps. In an ideal world, 80 percent of your organic social media content would be unique and fresh. Unfortunately, most brands aren’t able or willing to dedicate a content team towards this end. More commonly, brands are creating 20 percent original content and sharing other valuable and relevant third-party content 80 percent of the time. One way to maximize your original organic content ratio is by recycling and syndicating content through each channel based on platform capabilities, target audiences and preferences. 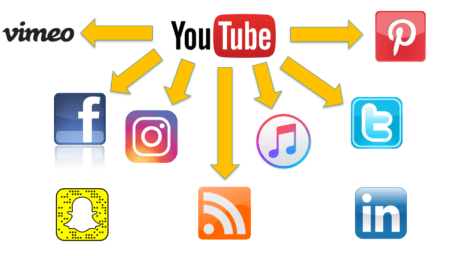 Per the previous example above and chart below, a single 2-minute video can be repurposed a myriad of ways: a 1-minute version of the video can be posts on Facebook, a 30 second version posted to Instagram and even shorter snippets to Snapchat or WhatsApp. The audio can be stripped out and syndicated as a podcast on iTunes or Stitcher. A summary post of the video or related content could be published on your company blog and promoted via posts on Twitter and LinkedIn. The possibilities are endless. Live streaming video is relatively new, at least from a consumer-use perspective. In 2013, Google’s introduced YouTube Live streaming platform to the public. Periscope made it as easy as a single click, and Facebook joined the fray. 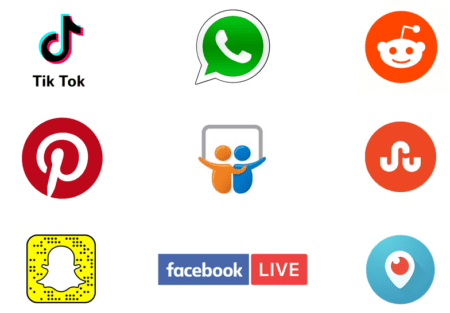 Now there are a host of video live streaming features in existing platforms for brands to choose from including Twitter, LinkedIn, WhatsApp, Instagram and Vimeo. Live streaming provides an easy way for brands to engage with fans in real-time and have a one-to-many conversation. The trick to building an effective live streaming program is to build a subscriber-base, so you can launch each new broadcast with a baseline of fans and build momentum virally. An alternative approach is live podcasting (audio stream only) or pre-taped podcasts. Podcasts are more affordable and easier to record and produce and, in some ways, have less competition (for ears vs eyeballs) than video. Related article: How to Extend Your Brand by Building a Podcast Strategy. I’ve always been partial to organic content as a driver of awareness and thought-leadership. That said, advertising can play a critical and effective role at generating awareness, credibility and lead flow. Currently, social media platforms offer robust targeting options based on profile information, behavior and interests. Each platform provides different ad products, audiences and targeting features. For example, Facebook offers the most robust targeting options, at the expense of user privacy. Facebook also owns & controls Instagram advertising within the same ad platform. LinkedIn is the most robust for B2B audiences, with more than a dozen targeting options, including interests. I’m not a fan of Twitter in general or as an ad platform, but it can be useful for specific audiences and campaigns. Google offers access to 90 percent of the websites on the internet via the Display Network, including YouTube. Other platforms provide options relevant to various industries and products, including Pinterest & Snapchat and may be worth testing. When I first started my career in digital marketing in 1996, social media consisted of bulletin boards and chat rooms. The early players in the social graph included Six Degrees, Friendster and MySpace. My, have times changed, even for the big players. Google+ failed to compete with Facebook, Microsoft had to buy its way into the market by acquiring LinkedIn. Regardless, there are many platforms worth testing and revisiting. Tik Tok out of China just surpassed 1 billion installs (with 600 million active users). If your audiences are Gen Z and global consumers, check it out. Don’t forget the older, more established but likely under-utilized platforms like StumbleUpon and SlideShare. Lastly, check out Reddit, Snapchat and WhatsApp for unique brand engagement opportunities. 1. Don’t criticize, condemn, or complain. 2. Give honest and sincere appreciation. 3. Arouse in the other person an eager want. 4. Be a good listener. Encourage others to talk about themselves. 5. The only way to get the best of an argument is to avoid it. 6. Show respect for the other person’s opinions. 8. If you’re wrong, admit it quickly and emphatically. 10. Throw down a challenge. I hope you’ve found value and inspiration from my ten social media strategies. Feel free to add your own strategies and tips for a more successful social media presence in the comments section below. Kent Lewis is a co-founder and the first President of SEMpdx, a professional trade organization based in Portland, Oregon that provides educational opportunities for local businesses and individuals interested in a career in search engine marketing. To pay the bills, he plays the role of President of Anvil Media, Inc., where he is responsible for managing operations, marketing and business development to achieve the company's mission: to build Anvil into the one of the most respected search engine marketing agencies in the world. In 2001, Lewis created pdxMindShare to build businesses and careers through networking and weekly emails featuring jobs and industry events. He is also an adjunct professor at Portland State University.